My latest love is pallet projects. It amazes me every time I search the Internet and find more projects using old wood or pallets. Why not use those old pieces of rundown wood for something new for the home or yard. Tonight I worked on a new project that involves the addicting website Pinterest. I love love love Pinterest and I can spend hours, I mean hours on Pinterest searching random items. 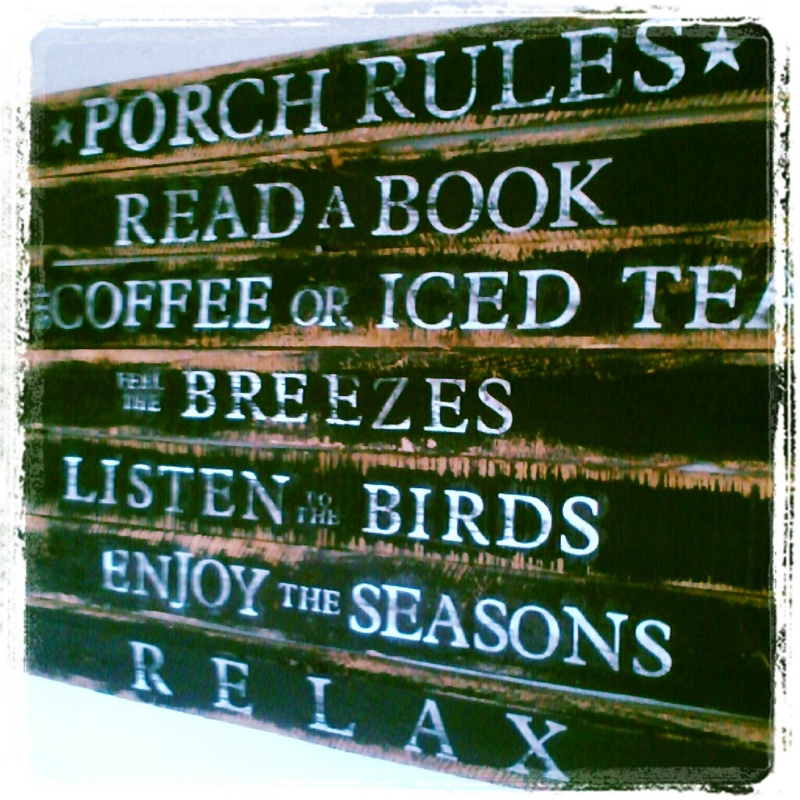 One of my finds on Pinterest was from an Etsy Store containing a Porch Rules Sign. I love this sign and who wouldn’t. It’s vintage, cute, black, and has a country charm design. I decided to create my own version of this sign for my front porch. First, I had my husband dismantle an old pallet. After my husband was finished it remained on the front porch till I had a few minutes of spare time and a plan of attack on my new porch sign. Then sign has seven rows so I used seven boards. I lined all seven boards across my table and painted the planks with a watered down acrylic paint. I wanted the paint to be absorbed into the wood not just on top. While the wood was drying I cut out the letters for each board using my Cricut Machine. After the paint was dry I then arranged the letters just how I wanted them. Then I glued and sealed the letters using Decoupage. Then I lightly brushed over the letters again with watered down acrylic paint and wiped off as much of the paint as I could. I wanted the letters to look old not bright white like they was when I added them. I then attached two additional blanks behind the boards to hold them together. 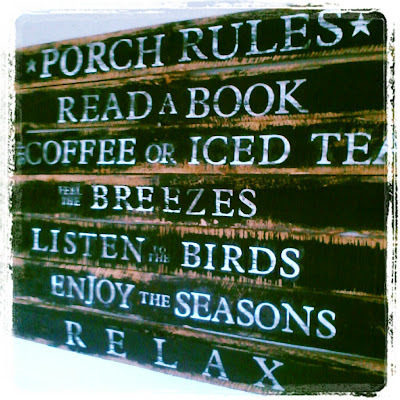 Finally my husband helped me hang the sign on the front porch. Love it! Just makes you want to grab an iced tea and sit out on the porch doesn’t it? I simply love your front porch sign made from pallets. Thanks for sharing at Throwback Thursday. What a great sign! I might try to make something like this for ‘family rules’. Thanks for sharing!